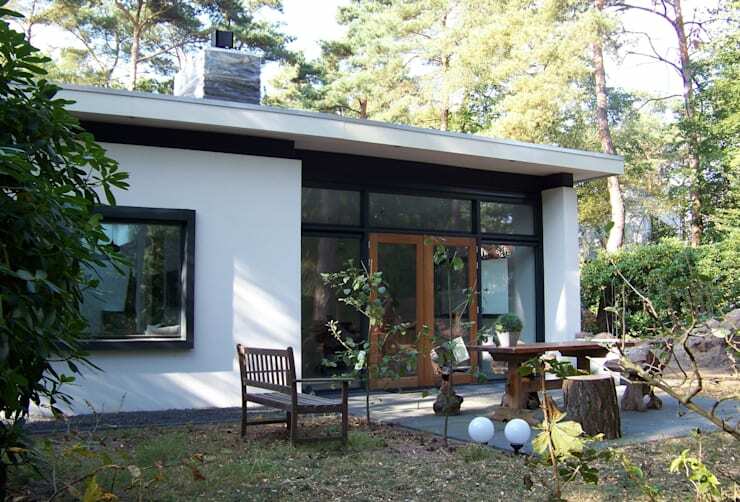 The cottage we visit today is simple, modern and filled with some style that would make even Hansel and Gretel want to spend the day admiring the woods from the comfortable interior. 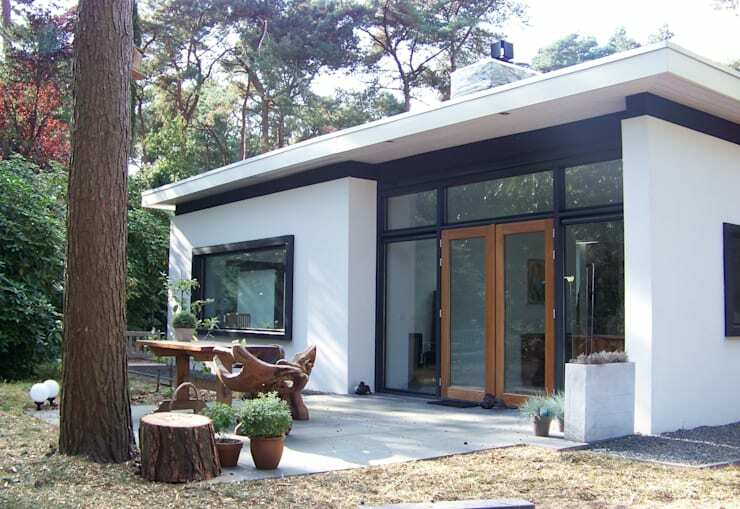 The home is set in a forest in the southern Netherlands and is bright, cosy and perfectly welcoming from all angles. The panoramic views, unbelievable sunshine and elegant furnishings makes this cottage a fantastic space to relax and enjoy the tranquillity and serenity of the surroundings. Yet, there is something so enchanting about being in the woods that makes a home just magnificent. 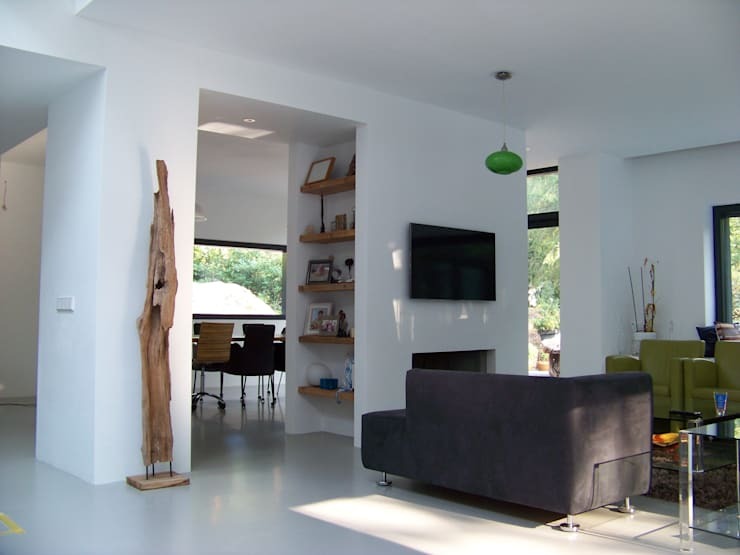 This perspective allows us to enjoy the modern elegance and simplicity of this designer home. The exterior is attractive in its minimalist charm, while monochrome hues along with wooden accents and a large glass door create a chic and comfortable exterior that is just welcoming. Enjoying the outdoors and fresh air is a delight with this outdoor dining table, who wouldn’t want to have every meal outside under the cooling shade of the tall trees? This cottage was first built in the 70’s and therefore it has a fantastic yet rustic inspired design, but it has since been revamped and given a bit more of a modern minimalist design. The architects chose a style that encourages a bright atmosphere that is elegant, while also making this cottage an ideal space for nature lovers and comfort seekers, hoping to escape the concrete jungle, one weekend at a time. 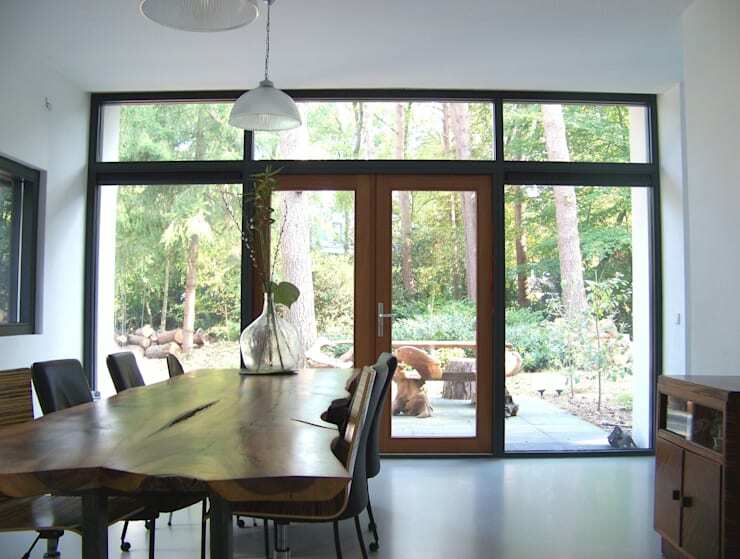 A dining room with a view is always a great choice of style for any home. It allows for a comfortable atmosphere that enjoys all the beauty of nature, but also makes a great alternative when the weather is cold and rainy. Admire the view from the comfort of the indoors, while entertaining some family and friends with a scrumptious meal. The dining room table is gorgeous, it’s made from solid wood and bring that natural environment of the surroundings into the home as well. 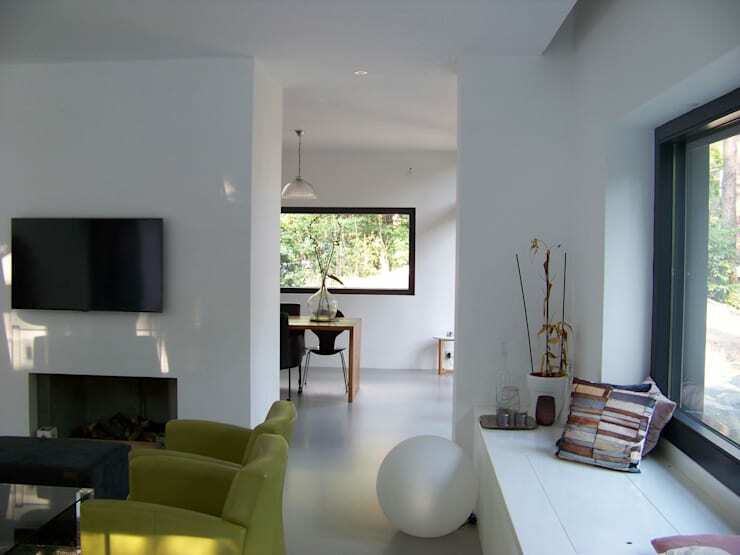 The white walls of this minimalist home are the perfect adornment to the chic and stylish living space, and with so many windows allowing ample natural light into the home, there is nothing quite like this contemporary design. This home décor is fun and cosy, while the clean lines and window seat makes perfect use of the scenery, light and spacious atmosphere. Enjoy the privacy of the forest, while reading a good book, or just take a nap in the gorgeous sunshine. The living room is perfectly styled with minimalist décor in mind, it’s uncluttered and tidy, while the large windows and doors make natural sunlight almost seem as though it is part of the décor. 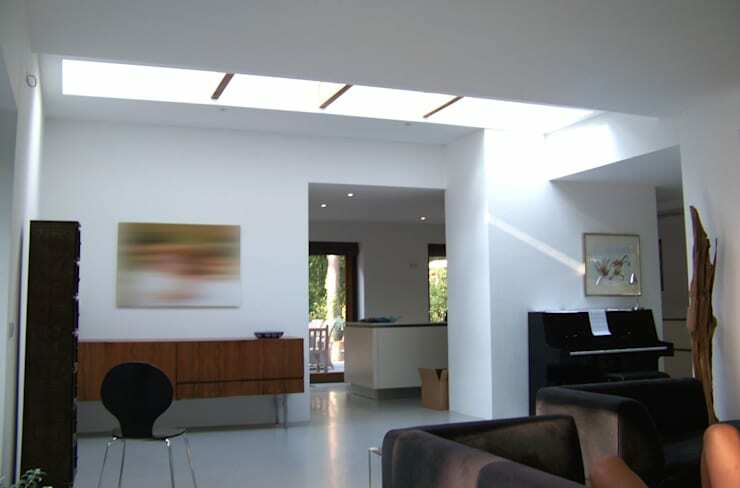 But, have you seen the skylight that drenches the room in even more sunshine during the day? Or how about enjoying the sights of the night’s sky from the comfort of your living room floor? This home has simplicity and elegance down to a tee and that’s what makes it even more inviting. The polished black piano is another way of showing that a family lives here, and that this home welcomes all features. This is a final look at the gorgeous home as this Ideabook come to an end. However, we have to admire the simple accessories that make this minimalist dream home come true. The colour choice works well with the forest setting of this home, while the modern furniture adds a classic and comfortable space to sit and enjoy the simple pleasures, whether it be a good cup of tea, the peace of the woods or even just the sound of laughter. It’s a living room that is functional and full of life! If you love beautiful homes, then A strong but cosy family home is a delight. Would you consider this home in the forest as a forever home?